Mahindra recently achieved the milestone of selling more than 50,000 units of Jeeto in the first two years. Celebrating the second anniversary of Jeeto, Mahindra is offering the same with a much lower down payment and accident insurance cover of upto INR 10 lakh. Mahindra Jeeto is currently the best selling last mile transport option in India. The four wheeler SCV market has 22 percent share of Mahindra Jeeto under 2 tonne payload. The improvement of sales by 25 percent in last financial year made Jeeto even more popular among the buyers. 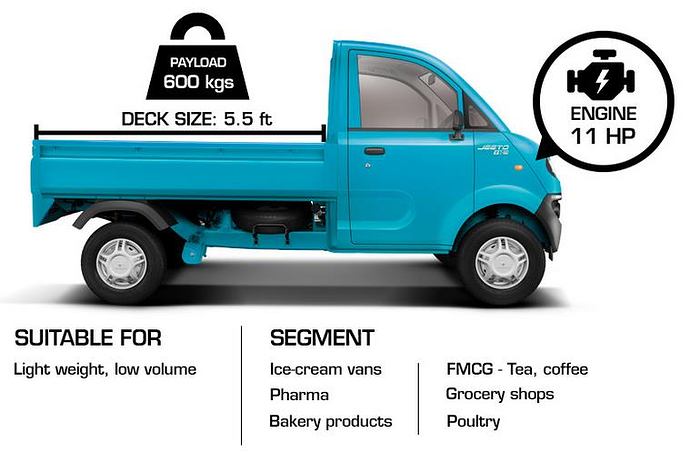 Jeeto can be bought in different payload, deck length and engine power options. Payload can be selected between 600 kg and 700 kg. Interesting to know that Mahindra had this model. 50,000 units in 2 years, that's decent, i guess!